Twenty years after the national minimum wage was introduced, it’s time to fight for a wage that people could really live on. When the national minimum wage was introduced twenty years ago, there was still significant debate over its likely effects. Dire warnings of a million job losses and businesses brought to the brink of ruin were commonplace, and even its most dedicated advocates were not entirely certain of its impact. Since then the debate has largely been put to bed, with twenty years of statistics delivering a clear conclusion – the minimum wage has been an unqualified success, boosting low paid workers’ wages while avoiding the job cuts some predicted. But despite the success of the minimum wage, its limitations have also become clear. In 2016 a new ‘National Living Wage’ (NLW) was introduced by then Chancellor, George Osborne. The new NLW represented an increase in the statutory minimum with a target rate of 60% of median earnings by 2020. This was a victory for Living Wage campaigners who had changed the terms of the debate and today, an updated NLW rate of £8.21 for over 25s came into force. But while it represented a welcome increase in wages for the country’s lowest paid, the name change belied a broader truth: that the minimum wage is not, in fact, a real living wage. The fight for a real living wage started much earlier than 2016, and did not begin in Westminster, but in east London. In 2001 the grassroots organisation Citizens UK brought together churches, mosques, schools and other local institutions to talk about the issues affecting their communities. One issue came up again and again – low pay. Workers revealed the desperate conditions many faced as a result of low pay, with parents frequently working multiple jobs just to keep their heads above water, often missing valuable time with their families as a result. The minimum wage was better than nothing, but it simply wasn’t providing enough to cover their costs, with even basic necessities like rent, food and gas bills beyond many families. Working with community organisers at Citizens UK these workers began to campaign, calling on employers to pay not only their directly-employed staff, but also their outsourced cleaners, caterers and security guards a wage that met their everyday needs. Supporters held rallies and charity music gigs, and a march down the Mile End Road called for all staff working in east London hospitals to be paid a living wage. These hospitals were among the first employers to join the movement. In 2011 the first UK Living Wage rate was announced and the Living Wage Foundation was created to continue the work started by those East End cleaners. Our aim was to accredit and celebrate Living Wage employers who signed up to pay all staff and onsite contractors a liveable salary. Since then, the Living Wage campaign has put over £800m back into the pockets of more than 180,000 workers, transforming the lives of workers up and down the country. Over 5,000 organisations have since signed up as Living Wage Accredited employers, from the micro to the multinational level, and in every UK region. But this isn’t a history lesson. Low pay continues to affect too many people, corroding family life, damaging mental and physical health, and limiting our collective potential. Around six million people are still paid less than the Real Living Wage of £9 per hour across the UK and £10.55 in London. Child poverty has once again risen, to nearly 3 million, with 70% of poor children in working families. A sharp increase in a range of household costs today, from water bills to council tax, and energy tariffs to prescription costs, threatens to further squeeze family finances. The Real Living Wage is the only independently-calculated wage rate based on the cost of living. As a result, it is the only wage rate that increases when these living costs rise. It covers everything from rent to childcare, transport, energy bills and food. Most importantly, it also covers the small things many of us take for granted, like being able to buy your children a birthday present, or a warm winter coat. For a full-time worker, the Real Living Wage amounts to over £1,500 a year more than the new National Living Wage. That’s the equivalent of almost six months’ food and drink bills for an average household, over a year’s average gas and electricity bills, or over 2 months’ average rent. That’s the difference a real Living Wage makes. In London, the gap between the government minimum and the the London Living Wage is even more stark, worth over £4,300 a year. At the Living Wage Foundation, we’ve spoken to workers who’ve moved from the minimum wage to a Living Wage and we know the difference it’s made. We’ve heard from workers who’ve had glasses of water freeze overnight in their bedrooms because they couldn’t afford their gas bills, and what it felt like to be able to stay warm at night. I’ve talked to parents who worked so many late shifts they barely saw their children, and the feeling they had when they could finally read them a bedside story. And I’ve spoken to workers throughout the country who finally felt secure and stable through a decent wage. Paying the Living Wage is clearly good for workers, businesses and society, and is vital if we want to build a high-skill, high-pay economy. But more than anything, it’s the right thing to do. 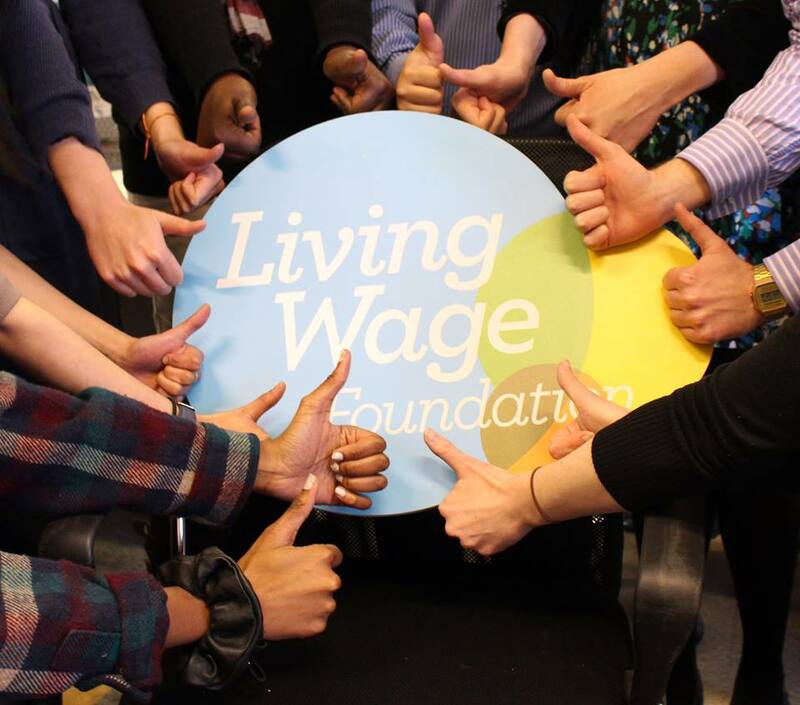 You can find out more about the Living Wage Foundation’s work at livingwage.org.uk. Katherine Chapman is the Director of the Living Wage Foundation.